Our good friends over at Morgan Harrison Home are featured in a fantastic article in the latest New England Home Magazine. Our cabinetry is featured in a number of their rooms (including the library and living room). Pick up your copy today! One of our good friends and frequent partner Michelle Morgan Harrison has just revamped her company's website and it looks fantastic. We invite you to browse around and take note of some of her amazing work (with many of the projects featuring our work as well) The two newest projects NAPA MEETS NEW YORK POOLHOUSE and GREENWICH CONTEMPORARY CLAPBOARD feature some of our mill-work (the latter consisting of a very cool two story library that we had the privileged of building). (Click on the photo to be brought to her website). Brass (well, satin brass) has been coming back in recent years and we are starting to see it used (quite effectively) with cabinet hardware and plumbing fixtures. What is new to us is its use now alongside other materials like wall coverings and tile. 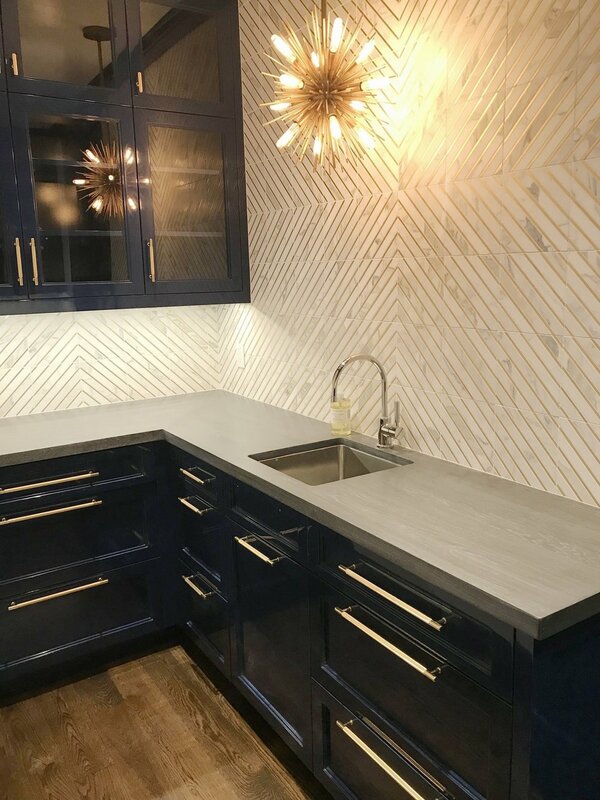 We had a customer come to us with an inspiration picture of a beautiful tile that had an inlaid brass strip surrounding boldly colored cabinetry and it caught our imagination. Here are the (almost) finished results. Who knew that brass would come back and who would have thought it could look this good? We built the cabinetry using a bold color to provide a contrast against the white and gold colors present in the tile. We also built the white oak counter tops to lend another complimentary element to the tile. The cabinets are painted with a high gloss conversion varnish (Color: Admiral Blue, Ben Moore), and polished to a very high shine (like a car). The hardware is Vesta Fine Hardware, the counter-top is white oak with a metallic gray finish, the tile is marble with brass inlay (customer provided and builder installed). While I would like to say we came up with all the ideas here we cannot. The customer was really the driving force behind the finishes and the architect (John Hapler) really provided the design. We executed the vision with input here and there (we can never keep our big mouths shut). The photo is just a preview taken with my phone, better/more shots of the rest of the kitchen to come. Look who made the cover of the latest CT Cottages and Gardens...that's right these guys right here at Sterling. Although we aren't mentioned in the article (just the designer and the architect), we are mentioned in the resource page in the back; that is generally how it goes. Kudos to architect Peggy Rubens-Duhl and to Havilande Whitcomb (designer) for the great spread in the article. Go and pick up a copy at the newsstand. I always appreciate the odd request or the unusual item; something that is a little unusual but well within our range. We got such a request a few weeks back to make a rustic barn door, a first for us. We were sent an inspiration photo (see below), the client gave us the material and we were off. So how does one go about building and installing a barn door? Well I will tell you dear reader. First things first, the inspiration photo shows a rustic but non-traditional door. What does that mean? Well doors have a certain structure because wood moves across its width due to seasonal changes (basically high humidity in the atmosphere - summer - means the wood grows and inversely shrinks with low humidity - winter). So if you ever wondered why old doors have frames around central panels (I mean who hasn't wondered about that, right?) this is reason. The wider the wood, the more it moves so if you have a wide door (like our barn door) you will need something to prevent the wood from moving so much that it affects the function of the door. Hence why most old school barn doors have either a frame around the panel or battens (cross pieces usually applied going diagonally across the face of the door, generally this is what we think of when we think of a barn door). After thinking about it we realized that we were going to have to build this door in an unconventional way if we were to be true to the picture. We decided that we would nail the exterior barn wood (tiled across the face) to a central stable core (in this instance 3/4" plywood, painted black). We laid out the pieces in a tile like formation, marked them and nailed them on (with a little glue for good measure). Wood being nailed (with a little glue) to the painted plywood. This wood was cut from reclaimed wood that was sliced pretty thin and as such was pretty funky to work with. You can see all of the checks, knots and how warped and bowed the material was. It all contributes to a very cool look in the end but not easy to set straight and put together properly. We glued pieces of oak on the two side edges to finish off the door. We also had to find the barn door hardware to finish off the piece. We looked around for a while (you wouldnt believe the amount of barn door hardware is out there, thank you Chip and Joanna Gaines) and found some hardware that looked very similar to inspiration photo at Richelieu. 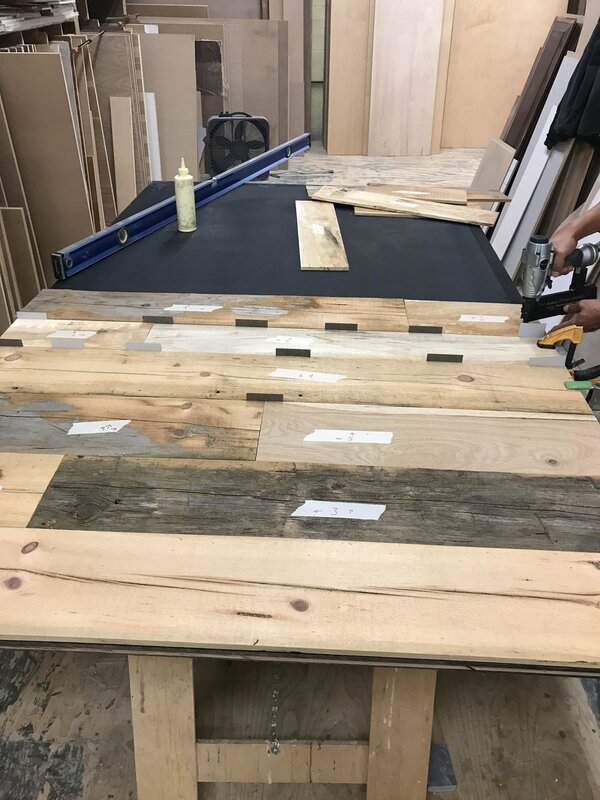 Since this was a rustic piece and really wasn't going to be handled very much (it was meant to be more of a wall art piece than a everyday functional door) we didn't put a finish on it (a rarity in our business). It came out beautifully in my opinion. I love coming back to homes after we have completed our work there. Most of my time at work is spent making sure that everything goes in well, that the customer is happy (etc. ), but I rarely get a chance to see it after it is all put together. Coming back into a home after all is done is an opportunity to step back and take pride in our work. When that house is staged (for sale) without having to do it yourself or pay someone to do it is like hitting the website content and picture taking lottery! Some pictures even look like I didn't take them on my iPhone. This particular kitchen has a really cool metal hood with strapping, which helps to break up the very monochromatic (ie BRIGHT WHITE) kitchen cabinets and marble counter tops. Another striking detail is the whole slab marble back splash. This is a relatively new design feature that seems to be cropping up more and more (to my ever lasting joy, since I dont have to lift the actual stone slabs). The only downside is that since marble is porous, it can get stained, especially behind the stove (but we havent built a kitchen for someone who cooks on a regular basis since 2010, so no real worry). Go on and look for yourself at the new photos (under whole houses, Darbrook) and see what you think about the rest of the house. Welcome to the first blog post of our new website, our company and me personally. Since this is a first on many scores I thought that I would give some information on myself for anyone that happens to come across this while surfing through. 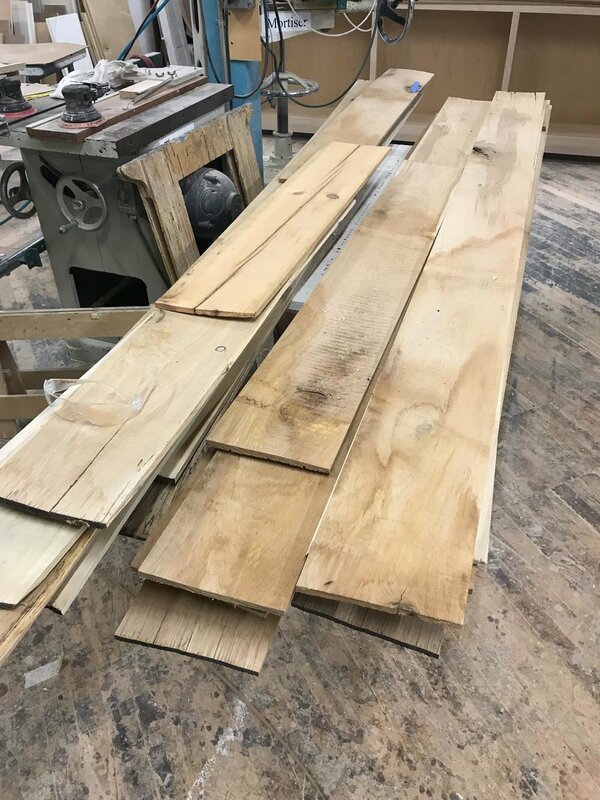 My name is Evan Marsillio and I am a woodworker; specifically I am a cabinet maker that builds custom kitchens, libraries, vanities, offices etc. etc. etc. When I say build I mean I normally am doing everything but putting wood to a blade. Since I am upper management, so to speak, I spend most of my day either answering questions from wherever they are aimed (email, phone, smoke signal etc. )., giving other people work to do (ie. build something) or solving some sort of problem or issue. This is the life for someone that helps run a business but enough about me. My father opened up Sterling Custom Cabinetry's doors in late summer 2004 after having been in the business of making cabinets since 1977. My auspicious arrival came in the fall of 2005 and the world is still the same. We have doubled in size since then and continue to grow steadily as the market allows.